Composed by Clara de Asís. Performed by Erik Carlson & Greg Stuart. UCSD, La Jolla, CA on July 9, 2018. Interview with Yuko Zama on Without. Review by Marc Medwin, Dusted Magazine, Oct. 2018.
Review by Peter Margasak, Bandcamp Daily, Best of Bandcamp Contemporary Classical, Oct. 2018.
Review by Brian Olewnick, Just Outside, Nov. 2018.
Review by John Eyles, All about jazz, Dec. 2018.
Review by Adrián Demoč, Hudobný život, March 2019. Without included in Steve Smith’s weekly playlist in National Sawdust, Dec. 2018. What is the allure of absence? Why are those taken with what we’re still calling the avant-garde, demonstrating a startling lack of precision, regularly confronted by what we equally sloppily still call silence? Maybe the sonic overload faced daily by many, the onslaught of timbral information bludgeoning perception from morning exit to evening reentry, has re-radicalized the notion of a place of something approaching and approximating a space for reflection. As demonstrated in the 43-minute Without, the fourth release on Yuko Zama’s Elsewhere label, Clara de Asis writes music that might be described as inhabiting such a space, one where possibilities flourish as realized potentialities, the place where sound constantly wends its way toward silence, or where the silence is just on the point of transformation into sound. The soundstage is simply set. Two musicians, violinist Erik Carlson and percussionist Greg Stuart commence on opposite sides of it and slowly reverse positions as the music unfolds. Its trajectory contrasts bowed, struck and plucked sounds of varying length and brevity, solo and in tandem, but, characteristically of Asis’ sound worlds, each is luminously clear, and many are rife with overtones, especially Carlson’s translucently bowed pitch that begins and concludes the piece. Even the multivalently breathy and sometimes steamily sibilant timbres Stuart conjures from bowing or caressing who knows exactly what objects emerge with stunning clarity and intricate detail. To assert that the music is performed by a violinist and percussionist, while accurate, would constitute an inadvertent feeding of misinformation to the unsuspecting. The players form a small and sonorously fluid ensemble rather than anything approaching a conventional duo. Anyone who knows Carlson and Stuart’s work, either together or in other contexts, will be aware of their attention to each sonic moment and the vast array of technical and imaginative prowess they bring to each event. To my ears, what holds the music together, and it coheres remarkably well despite a steady juxtaposition of disjuncture and recurrence, is the trajectory of each sound in its surrounding space. The scoring seems, from a listener perspective, to foster such precise placement of sonority that even its sometimes lengthy absences take on shape, an almost pictorial form. they are neither the stratified silences of AMM nor the alternately expectant and contemplative places of semi-repose that Antoine Beuger or Jurg Frey might offer, or rather, they don’t serve exactly the same purposes. It could be that Asis’ silences are closer to the poignant understatement Harold Pinter really wanted in his pauses, anticipating, implying if not directly embodying motion. Via a wonderfully evocative title and her excellent choice in performers, Asis allows absence and presence their starkly defined and deeply poetic symbiosis. Clara de Asís is a Spanish guitarist and composer living in Marseilles, France, and her music explores sound in its purest, most abstract forms. She’s a prolific performer, but she wrote Without for two excellent American experimentalists: violinist Erik Carlson and percussionist Greg Stuart, both of whom possess deep affinities for her concerns, the instrumental vocabulary to bring them to life, and the improvisation flexibility to flesh out her schematic score. The composer provides a detailed framework for the musicians, mapping out the placement and duration of specific passages, with looser indication of textural ideas, volume, and percussive materials, but in its execution both Carlson and Stuart are required to make many of their own choices. Over the course of 44 meditative, opulently grainy minutes, the musicians carve out extended passages of elusive long tones and weighty silences. Stuart deploys bows on a wide variety of objects of metal, wood, clay, ceramic, and glass, constantly altering the timbre and bite of his frictive machinations—whether high-pitched sine-like tones or swirling rustles—creating both collisions and synchronicities with Carlson’s meticulously pitched violin. There are a few fleeting noh-like moments where instruments are plucked and struck. The musicians impart a dazzling sensitivity to the piece, moving through the score with unhurried grace to arrange the compelling studies into a beautifully austere, moving experience. Prior to this release, I’d known de Asís as a guitarist but here she’s in the role of composer. Violinist Erik Carlson and percussionist Greg Stuart offer a reading of her ‘Without’, a piece that strikes me as more complex and, to me, more difficult than I would have guessed at first blush. ‘Without’ is made up of a number of sections which, I think one could say, generally move from grainier and more abrasive to less so, though not in an obvious path and by no means always. It leaps right in with the violin offering high, needle-like harmonics with what sounds like numerous objects being roughly rubbed and tossed on a bass drum. Four minutes in, this abruptly shifts to a low vibraphone pulse; there’s some other, obscure activity, probably ancillary sounds made by Stuart. Carlson enters, again pitched high but somewhat cleaner, a kind of Tony Conrad line weaving through the vibraphone cloud. This is followed by solo violin, a single note, held for about eight seconds, repeated by itself until joined by a clear, high bell, the pair heard in an irregular series with a decent amount of silence. I have the impression of an object with two main aspects being viewed from various angles, in differing light conditions. There’s relatedness but a certain amount of apartness. This, for me, creates something of a challenge in hearing the piece as a whole, but it’s a very enjoyable challenge, surely more an issue for these ears than anything amiss on the part of de Asís. Some 32 minutes in, there’s an especially lovely sequence with vibes and lower, though still sandpapery, violin that serves as a kind of oasis after a demanding journey. This merges into isolated, low plucks on the violin, soon accompanied by clear wood block strikes, a pattern similar to that of the violin/bell sequence heard earlier. The blocks accompany a sustained violin tone very similar to that which began the work, closing it out. Rigorous, spare, only occasionally luxuriant, ‘Without’ is a fine, demanding recording. Following closely on the heels of the Clara de Asis release Do Nothing (Another Timbre, 2018), Without is an ideal complement to that recording as it highlights different facets of de Asis’ music and gives a more detailed picture of it. In particular, where the earlier album consisted of six shorter tracks performed on guitar and percussion by de Asis herself, Without is very different, just featuring the forty-three-minute title track, which was written in 2018 for and performed by the duo of Erik Carlson on violin and Greg Stuart on percussion. This realisation of the piece is characterised by the togetherness of Carlson and Stuart’s playing, which itself owes a debt to the precision of de Asis’ composition; by all accounts, she “gave a precise framework for the position and the duration of each sound section and each silence, as well as a rough outline for the texture and the volume of each sound, the use of tone or noise (or tone-noise), and the materials for the percussion.” Of course, Carlson and Stuart are experienced players, not androids, so their own inputs are as important as those of de Asis; in other words, credit is due equally to each of the three. For the listener, the end result is a slowly-evolving but varied soundscape in which every note from both players can be heard perfectly throughout; it makes for relaxing listening which can be repeated time and again without ever becoming stale. A collective triumph. Mladučké vydavateľstvo Elsewhere je „dieťaťom“ Yuko Zama, dlhoročnej fotografky, dizajnérky a producentky známych vydavateľstiev experimentálnej hudby Erstwhile Records svojho manžela Jona Abbeyho a Gravity wave gitaristu a skladateľa Michaela Pisara. Erstwhile sa orientuje prevažne na silne redukovanú elektronickú hudbu. Spriaznenosť s estetikou vyššie spomenutých vydavateľstiev je zrejmá už z výberu samotných umelcov – mená ako Jürg Frey, Clara de Asís či Stefan Thut by v ich katalógu určite neprekvapili. Kvalitou doposiaľ vydaných nahrávok im však tvorí veľmi silnú konkurenciu alebo skôr (v najlepšom slova zmysle) akýsi doplnok. Doterajších šesť vydaných albumov však dokazuje, že Elsewhere bude minimálne rovnocenným partnerom spomenutých vydavateľstiev, mapujúcich „tichú“ komponovanú, improvizovanú, komprovizovanú hudbu, ako aj podieľajúcich sa na formovaní, obohacovaní a (azda aj) prekračovaní podobného hudobného cítenia. Album 120 Pieces of Sound predstavuje dve vyše polhodinové skladby švajčiarskeho skladateľa Jürga Freya. Ako napovedá už názov albumu, dohromady naozaj predstavujú stodvadsať „kusov“ zvuku alebo trochu presnejšie: súzvukov, (z)hlukov, okamihov zvuku, rôzne oddeľovaných tichými pauzami premenlivých dĺžok. Prvá z nich, vyše tridsaťminútová 60 Pieces of Sound, používa výhradne inštrumentálnu sadzbu. Skladba je notovaná ako trojhlas pre bližšie neurčité obsadenie, pričom tóny dvoch hlasov sú presne určené (notované), zatiaľ čo tretí hlas je zámerne nechaný „napospas náhode“ a môže byť interpretovaný jedným alebo viacerými nástrojmi či zvukovými zdrojmi súčasne. 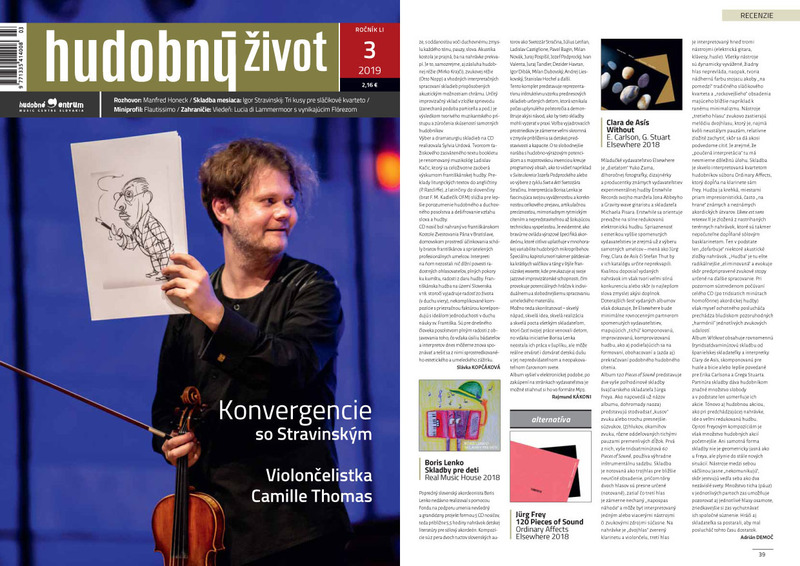 Na nahrávke je „dvojhlas“ zverený klarinetu a violončelu, tretí hlas je interpretovaný hneď tromi nástrojmi (elektrická gitara, klávesy, husle). Všetky nástroje sú dynamicky vyvážené, žiadny hlas neprevláda, naopak, tvoria nádhernú farbu stojacu akoby „na pomedzí“ tradičného sláčikového kvarteta a „rockovejšieho“ obsadenia majúceho bližšie napríklad k ranému minimalizmu. Nástroje „tretieho hlasu“ zvukovo zastierajú melódiu dvojhlasu, ktorý je, najmä kvôli neustálym pauzám, relatívne zložité zachytiť, skôr sa dá akosi podvedome cítiť. Je zrejmé, že „poučená interpretácia“ tu má nesmierne dôležitú úlohu. Skladba je skvelo interpretovaná kvartetom hudobníkov súboru Ordinary Affects, ktorý dopĺňa na klarinete sám Frey. Hudba ja krehká, miestami priam impresionistická, často „na hrane“ známych a neznámych akordických útvarov. L’âme est sans retenue II je zložená z nastrihaných terénnych nahrávok, ktoré sú takmer nepočuteľne dopĺňané sólovým basklarinetom. Ten v podstate len „dofarbuje“ niektoré akustické zložky nahrávok. „Hudba“ je tu ešte radikálnejšie „eliminovaná“ a evokuje skôr predpripravené zvukové stopy určené na ďalšie spracovanie. Pri pozornom sústredenom počúvaní celého CD (po tridsiatich minútach homofónnej akordickej hudby) však myseľ ochotného poslucháča prechádza bludiskom pozoruhodných „harmónií“ jednotlivých zvukových udalostí. ide o veľmi redukovanú hudbu. Oproti Freyovým kompozíciám je však množstvo hudobných akcií početnejšie. Ani samotná forma skladby nie je geometricky jasná ako u Freya, ale plynie do stále nových situácií. Nástroje medzi sebou väčšinou jasne nekomunikujú“, skôr jestvujú vedľa seba ako dva nezávislé svety. Množstvo ticha (páuz) v jednotlivých partoch zas umožňuje pozorovať aj jednotlivé hlasy osamote, zriedkavejšie si zas vychutnávať ich spoločné súznenie. Hráči aj skladateľka sa postarali, aby mal poslucháč tohto času dostatok.